Best hotel breakfast & services provided. Total luxury. Dubai, a huge empire built on the profit made from oil and gold. It is a gateway to Europe for many Asia and Oceania countries and it is a popular stop-over for tourists flying with Emirates. The tourism created in this city is absurdly amazing. Are you aware that Dubai’s hotel vacancy rate is the lowest in the world? the hotels are almost all packed out night after night and only settles down during the hot summer months. Each prestige hotel chains will build at least at two or three location in Dubai and famous chefs from across the world would set up restaurants in all these luxury hotels. Beside food, there is shopping! Malls, shopping centers all around. Dubai is heaven for the riches. If you have the money, you will enjoy your stay here! This is the hotel we stayed in. Mövenpick Ibn Battuta Gate Hotel. Large and impressive. This time we boarded Emirates airline for our travels to Europe and north Africa, hence on our travel back, we had the option to stay in Dubai for few more days (Further Reading: Dubai Stopover with Emirates“. Although it was our first time in Dubai, we were utterly exhausted from our travel in Morocco (read more from our blog about this country) so the main theme of our time in Dubai is rest! 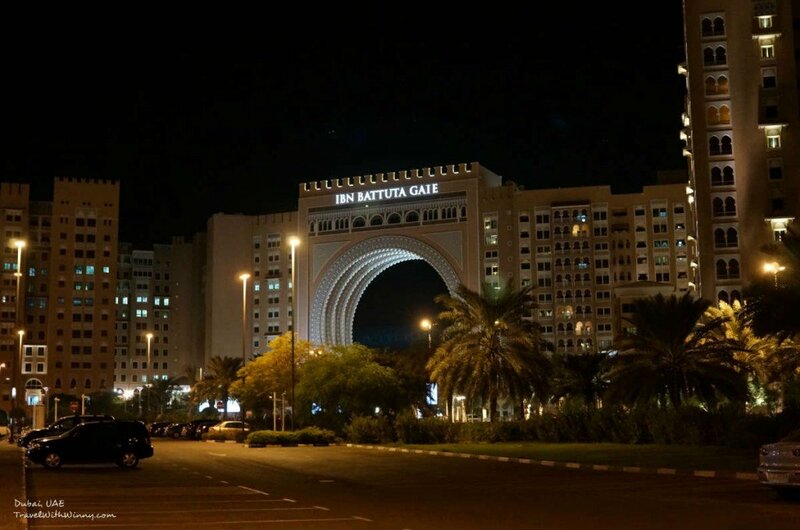 We therefore chose Mövenpick Ibn Battuta Gate Hotel as our base for the four days we were in Dubai. This hotel is more like a luxury relaxation village as oppose to the other luxury hotels which were high rises around the city centers. Although it is a bit far from Dubai Mall but there is a subway station just outside the hotel so you can arrive there in just 25 minutes. It is very convenient. There isn’t really that much to see in Dubai. You could probably just spend two days to see all you need to see here. The main activities here is shopping and resting! Welcome to Mövenpick Ibn Battuta Gate Hotel! 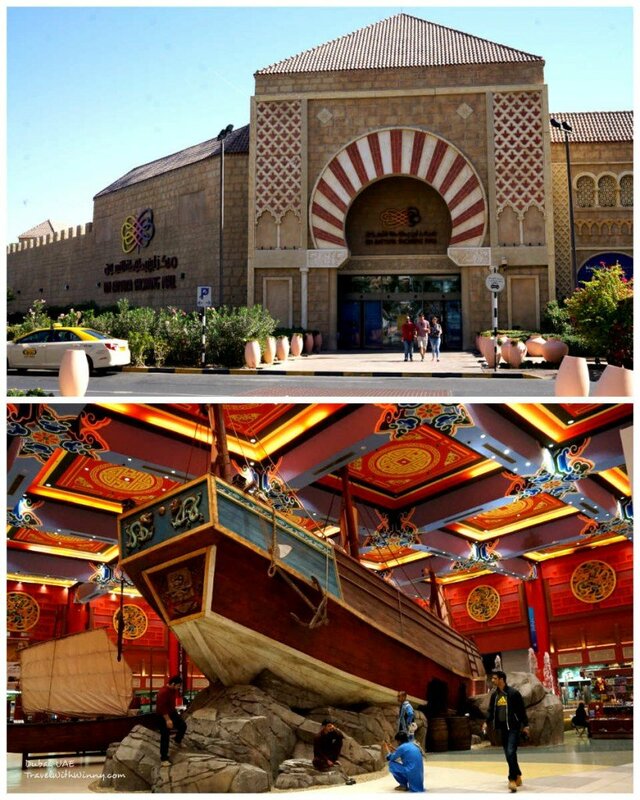 Directly opposite to Mövenpick Ibn Battuta Gate Hotel is the world’s largest themed mall called Ibn Battuta Mall. It is opened to 10pm every night. There is even a supermarket in the mall for anyone who needs some fresh produce during their stay. This Mall and our hotel is both named after a very famous Muslim explorer, Ibn Battuta. Ibn Battuta was born in 1304 and has traveled across 44 countries, spanning across 117,000 kms. Before the industrial age, he probably is the explorer that has traveled the furthest and been to all the Muslim countries. Each section of this mall and each floor of our hotel is dedicated to six of the countries that Ibn Battuta has travelled to. These places are Egypt, China, India, Andalucia, Iran and Tunisia. Each floor of the hotel and each section of the mall are extremely unique. If you think the food in hotel is too expensive, you could always go eat in the food court in the mall. There are more than 50 different stores to choose your lunch or dinner from. More importantly, there are more than 270 stores that almost always have good discounts. For example, we found famous brands like Top Shop, Pierre Cardin having decent discount on good-looking wear. It is the only place in Dubai that we bought something during our shopping sessions! Ibn Battuta Mall. Only located opposite to this luxury hotel’s main car park. This is the China section of the mall. Very unique! 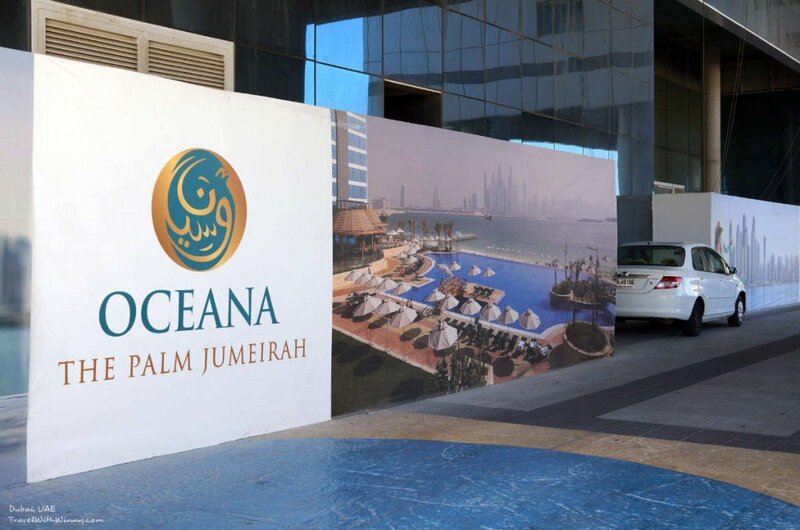 The most memorable thing that this Five Star Hotel has to offer is its private beach called the Oceana! it is located on the man-made Palm Jumeirah. It is a man-made Heaven!!!! Oceana Club. 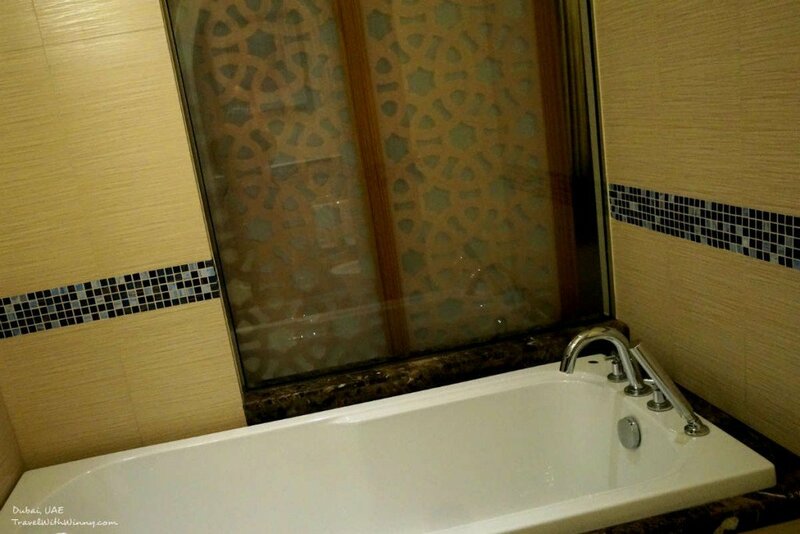 Exclusive to people who stays in Mövenpick Ibn Battuta. 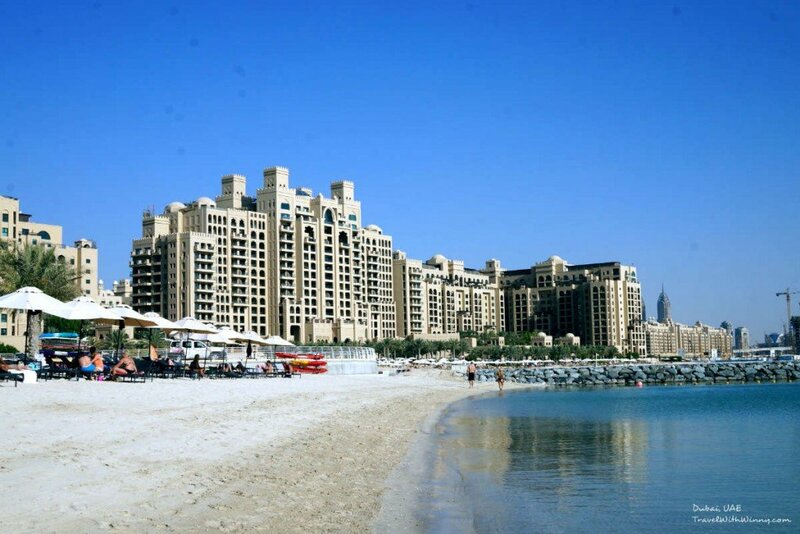 Most of the Five Star Hotels are located on Jumeirah Beach. There, they have very beautiful beaches, apartments and a peaceful environment. However their scenery is really not that impressive. If you are located on the Palm Jumeirah and look towards the Jumeirah Beach… you get to look at the skyscrapers of Dubai. It is definitely not a beach scenery that you get to see every day! Only in Dubai. 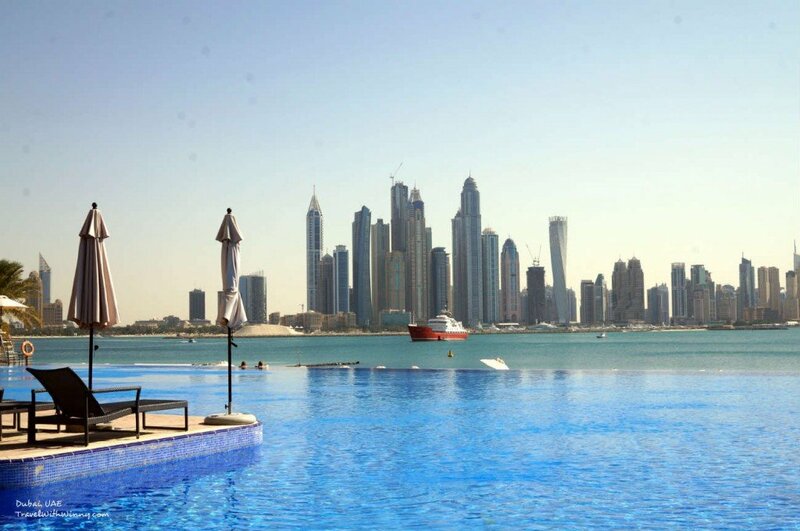 Only on Palm Jumeirah you would be able to enjoy the skyline of Dubai like this. Every hour of the day, there is a private free bus that can take you to Oceana Beach Club. However the seats are limited so it is best that you book a day early. Otherwise you could always take the taxi! When we were pondering on how long we should stay there for, the staff suggested that most people stay there for the day. We were quite puzzled at that point on how can people spend a whole day at a beach club. Can’t believe there is an infinity pool like this!!! Unfortunately too many beach umbrellas prop up now… ruining the photo. 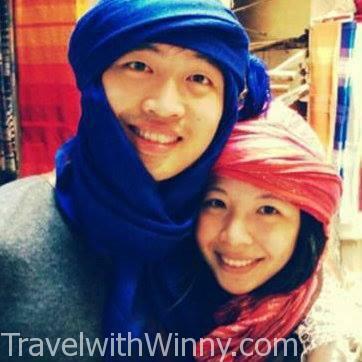 When Winny and I first arrived at the beach club, we couldn’t believe our eyes. We gazed at the marvelous sights of what money can create. A luxury relaxation heaven equip with a scenery that you could not even imagine. We first were met with an infinity pool that joins towards the sea. On the horizon there lies the magnificent skyline of Dubai. 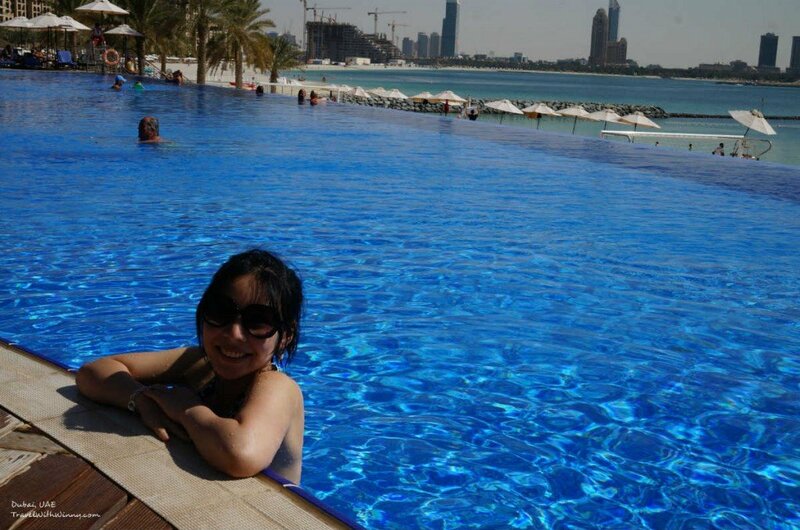 there were many seats around the infinity pool and on an island located in the middle of the pool. You also have the option to walk down onto the private beach as well. There you could comfortably lie down, sun bake and simply relax. 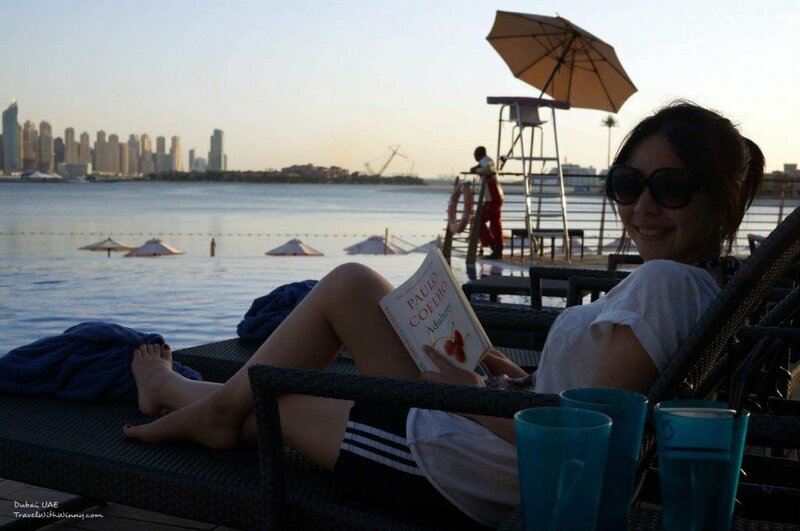 It was a great place to read a book! Small bridge that leads to the middle island in the pool. Good for photo purpose. In the Beach club, they have their own bar and restaurant. Although not free, the food wasn’t expensive. As we haven’t had much vegetables in the last couple of weeks so we decided to order two large salad. 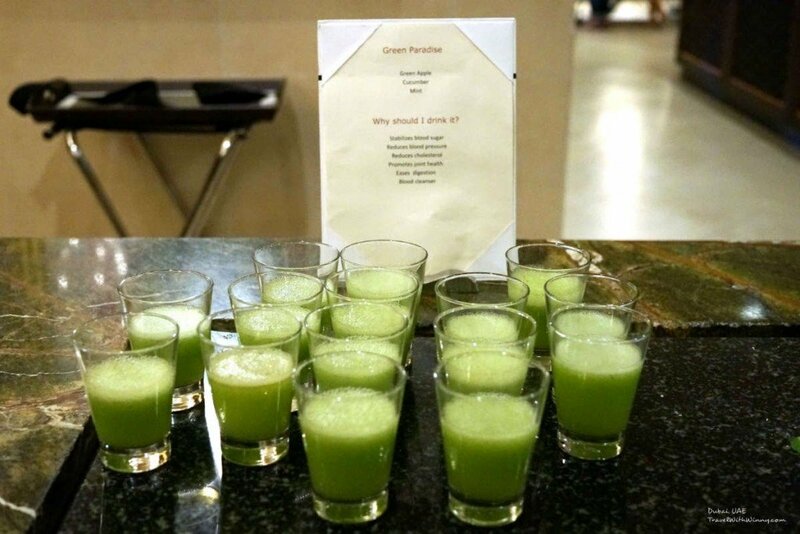 It was delicious, very refreshing and was definitely five-star hotel standard. If your hungry… good food is freely accessible. Near the restaurant, there are a short flight of stairs that leads to our private beach. We realized that there was a private beach there but didn’t realize that it was so big. We felt like we were in those Bond movies where we were staying at millionaire exclusive clubs. There are plenty more seats here with huge umbrellas for the sun and an area for volleyball. I believe we were the most hyper customers around. Running around taking pictures and doing stupid poses. We were quite afraid that we fit into the Asian tourist stereotype doing our lame Asian touristy thing. haha… all well we really enjoyed ourselves. FYI don’t be too lame like us and ask the concierge if we need to prepare our own beach towels… Everything is prepared for here. We even moved one of the beach chairs close to the water to take some of these insane pictures. We used to not understand how people can go to island resorts for holidays. Lying around seems like such a waste of time. What we don’t realizes is that relaxing like this is a complete luxury. Especially in recent times, we have worked our butts off almost every days of day lives. A bit of relaxation really feels good. Seems like we are at the age where we can sit back and read a book all day. We had such an awesome time there! 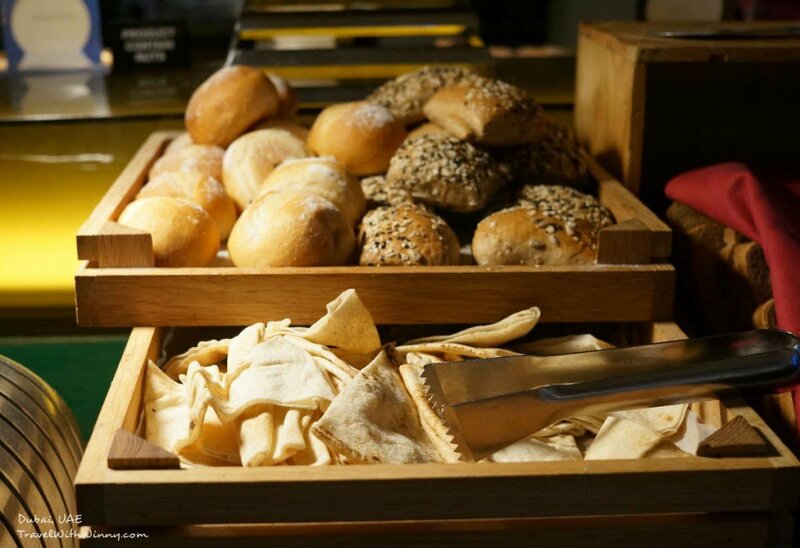 Before we even arrived at this hotel, Winny has done some research and found that most people found that the breakfast buffet here at Mövenpick Ibn Battuta was one of the best ones they have ever had. Winny had a plan that if we sleep very late, and eat extremely full with this buffet breakfast, we could save money on lunch. haha… we sound so stingy. However, the awesome buffet breakfast was one of the major reasons we picked this hotel. It sure didn’t disappoint! The breakfast here is very internationalized like the theme of this hotel. 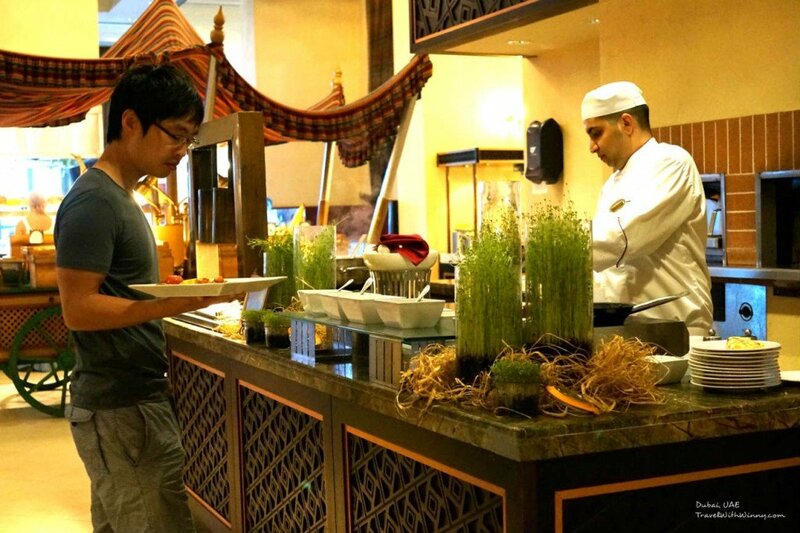 You could have a choice of Arabic food, western food, even Japanese food. Huge variety and good quality. The pictures here does not justify how much they had, but could give you an idea of the variety. They even had chefs at multiple stations cooking up some omelets. What surprises me is that at this one station, there is someone constantly mixing up fresh juices! If juices were blended and left out too long, many of the nutrients would dissipate. Hence, they only blend up just enough so the juices wouldn’t sit around for too long. Really can’t believe a free buffet breakfast would have such a service. There is even a sign to let you know what ingredients are in the juices today. The hotel even did a good job with the bread. Knowing Winny, she is super picky with her bread, because she only eat the “healthy ones” none of this white bread crap. We sometimes have to travel into city center in Adelaide to just go to this bakery that bakes dark rye in a compacted way. The hotel somehow managed to please Winny with their breads. They were healthy and they were fresh. We always seemed to be able to eat so much that we really don’t have to eat lunch every day… plan success! There is Free WI-FI accessible from almost anywhere in the hotel and the environment is very comfortable, especially the outside area. 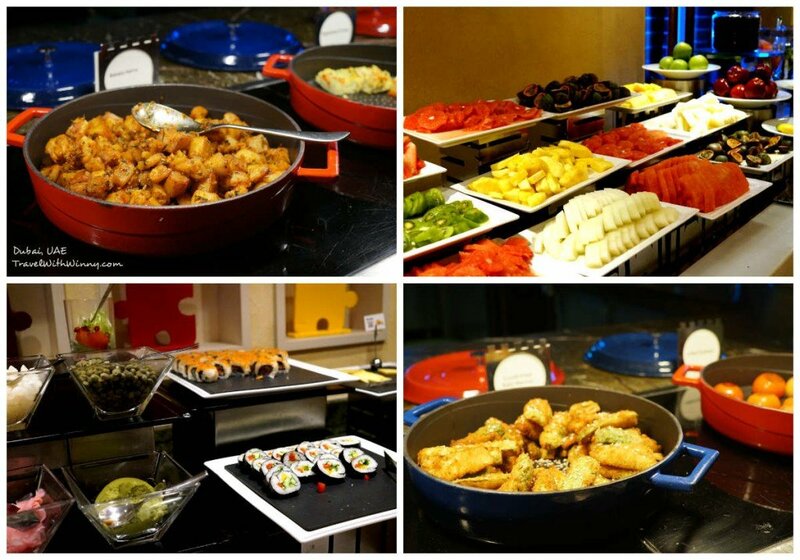 I really want to go back to the hotel just for this perfect breakfast buffet! You can choose to eat inside or outside. In the Hotel, there are in total of nine different restaurants or bars you can go to. Each restaurants is equip with top quality chefs making amazing food. If you really think these food doesn’t suit you, you could still go to the mall across the car park for an even larger variety of selection. 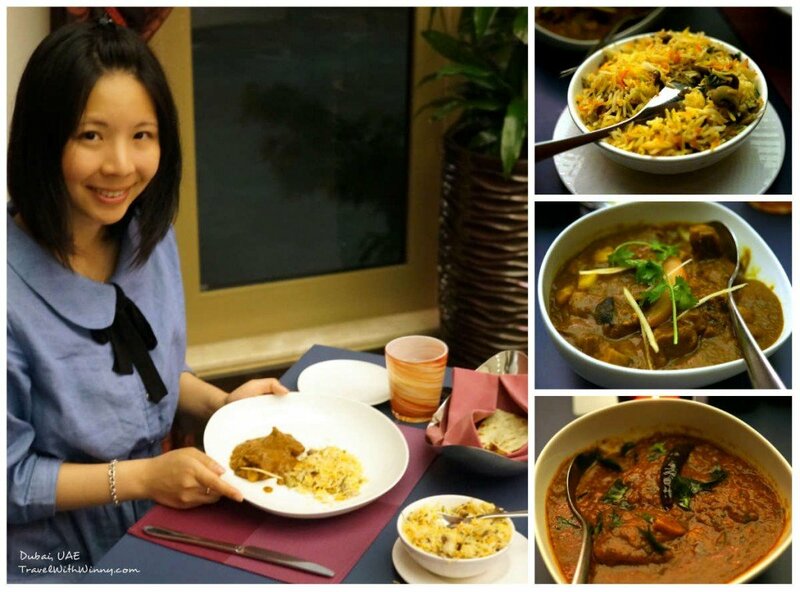 The restaurants in the Hotel includes but not limited to Asian, Italian, Indian and American. There is a desk with a lady specifically taking bookings for these restaurants. We ate at two of these restaurants. One of them is called Sicilia (Italian restaurant) and the other one is called Chor Baaar (Indian Restaurant). 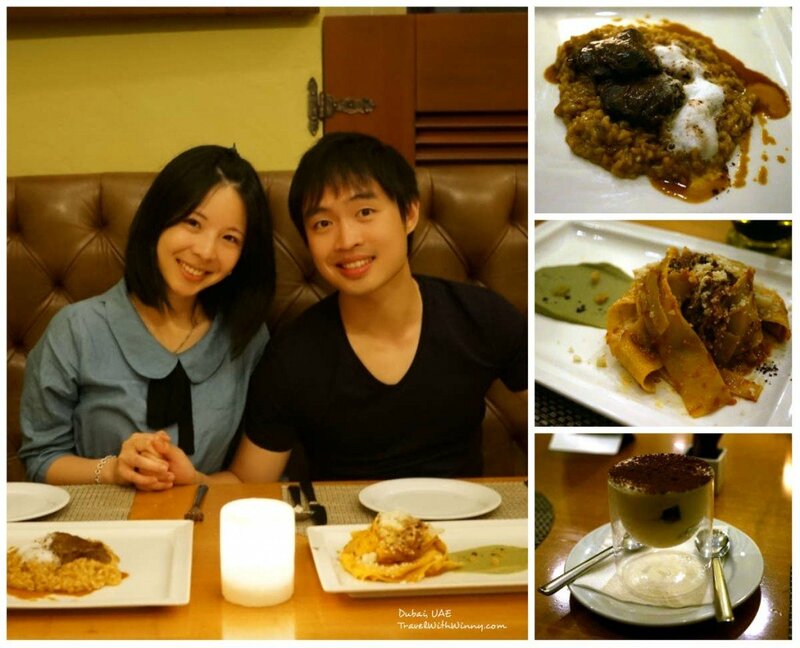 Both of them had extremely high standard, especially the Indian restaurant. Chor Baaar won the best Indian Restaurant in Dubai and it sits on number three on Trip Adviser. The Italian Sicilia was great too. Reasonable priced and the food was amazing. The hand-made pasta was chewy and tasty. 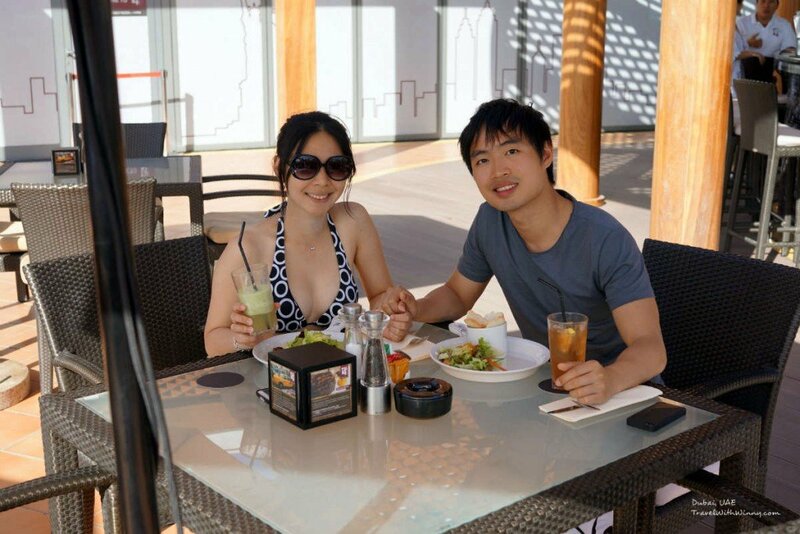 Dubai is one of the few countries where we found great service and great food no matter where we go. Sicilia, also an award-winning restaurant! Like most luxury hotels, there is a huge lap pool on the roof. Although there are almost no one around by the time we got there at night, there is still a life guard on stand by. There are towels on every seat around the pool. We could use them and leave them there. There are also a huge gym and spa room for you to relax in. 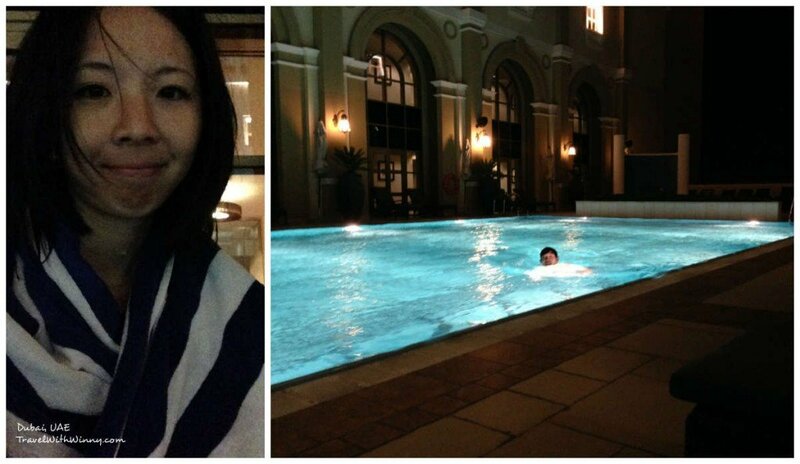 As the weather was a little too cold by this time, I was the only one that did a representation swim in the heated pool. Although the pool is heated, it was still a little too cold for Winny. 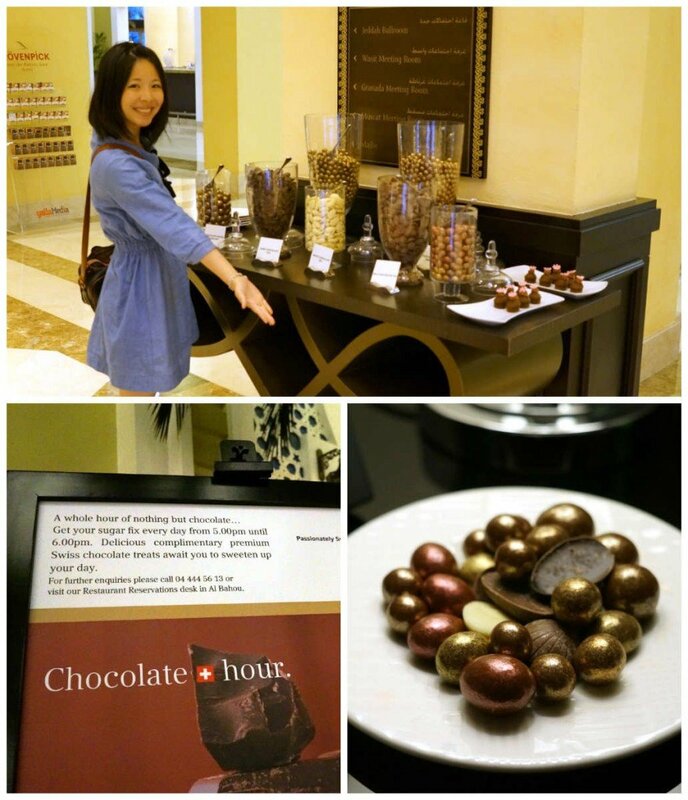 Winny’s absolute favorite “Chocolate Hour”! Between the hours 5pm-6pm, you could stand here and enjoy a limitless amount of quality Swiss chocolate! Winny and I would always try get back to the hotel for this awesome service. We usually ruin our apatite for dinner as a result. We always stand there for so long, Winny feels a bit embarrassed of my chocolate eating behavior. We even made friends with the servers of chocolate hour. We got offered plates to take back to our room so we didn’t have to stand there to eat. There are sometimes chocolate drink and freshly made chocolate cakes that gets served with these chocolate balls. All are extremely delicious, and definitely not some cheap chocolate. Plate full of chocolate that we took back to the room. 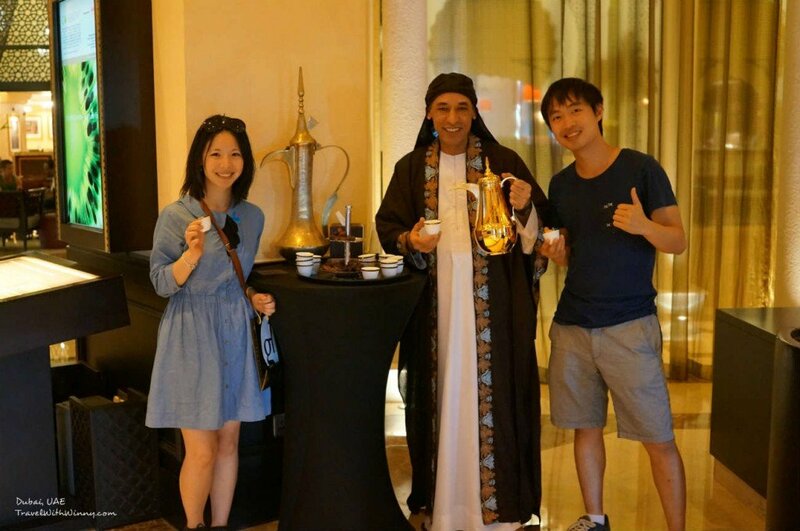 At the lobby there is a place where they serve an unlimited amount of Arabic coffee matched with dates. The coffee is sugar-free so it matches the sweet dates very well. We made friends with this man who serves Arabic coffee because we stood there for quite some times. He told us his story and learnt that he is Egyptian. He said because of work, he has left and worked in Dubai for more than 10 years. He showed us pictures of his daughter and talked about his family. Standing here serving coffee all day must be boring! He kindly taught us the customs of drinking Arabic coffee, such as when you want a refill you shake your cup. He was such a great guy and very positive. 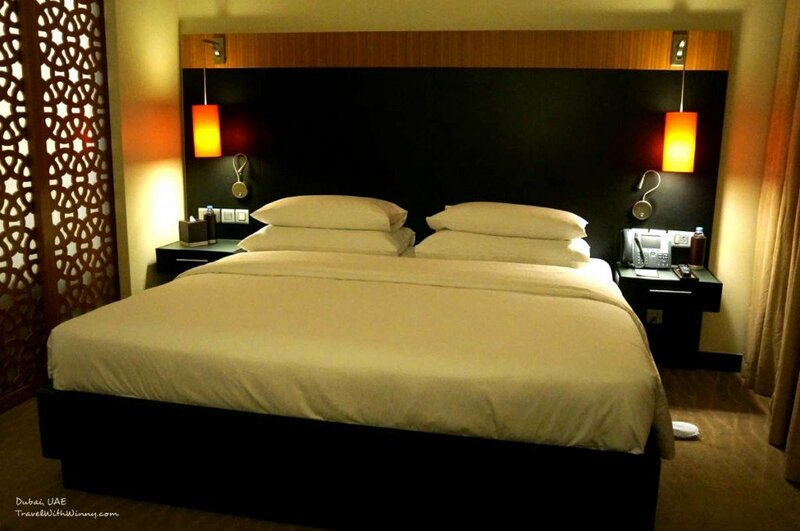 This time we booked the Deluxe Room, it has a huge King Size bed. Room was quite spacious. According to the internet, it is around 40 meter squares. It comes with free WI-FI. The sound proofing system is good and the room is completely silent even with the mall directly across us.The bed was great quality too. The showering system was complete too. The bathroom was huge and equip with a comfortable tub. The whole room was Moroccan themed as we live on the Moroccan floor. This room makes us think that we living like Moroccan royalty! As all five-star luxury hotels, the shampoo, soap and body lotion was top quality too. Our very awesome bath tub. 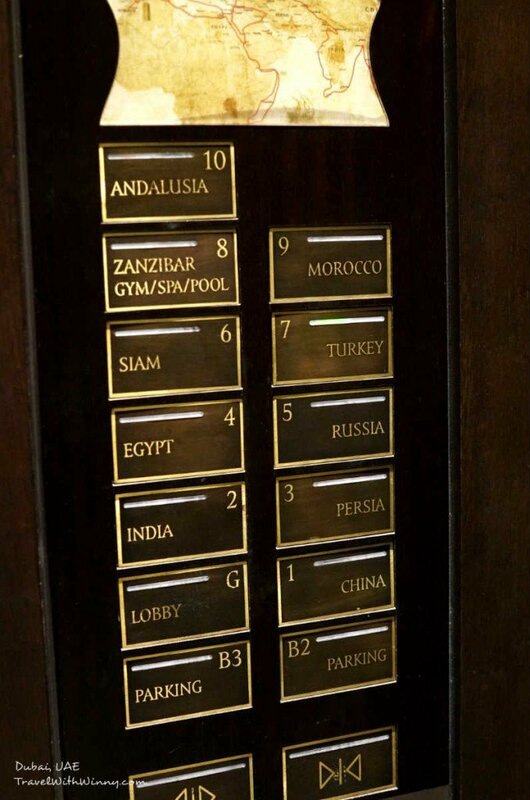 As this Mövenpick is based on Ibn Battuta the explorer, every floor is individually themed as the picture of the elevator buttons below. Through my very thorough explanation, I hope some of you would be able to come stay at this awesome hotel. I enjoyed it and I hope you would too! If you are just transferring like us, This hotel can definitely help you adapt to the time zone differences. 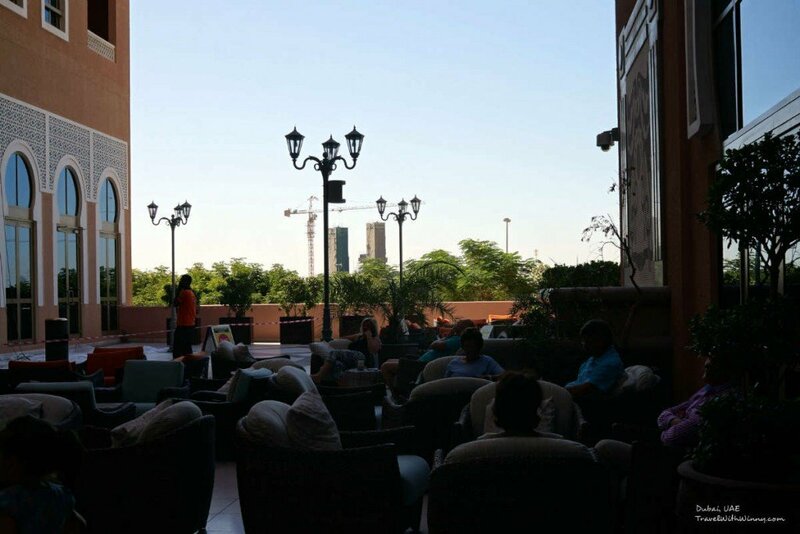 Mövenpick Ibn Battuta is definitely a luxury place to stay in! To get ideas on what to do in Dubai, don’t forget to read our “Top 10 things to do in Dubai“. 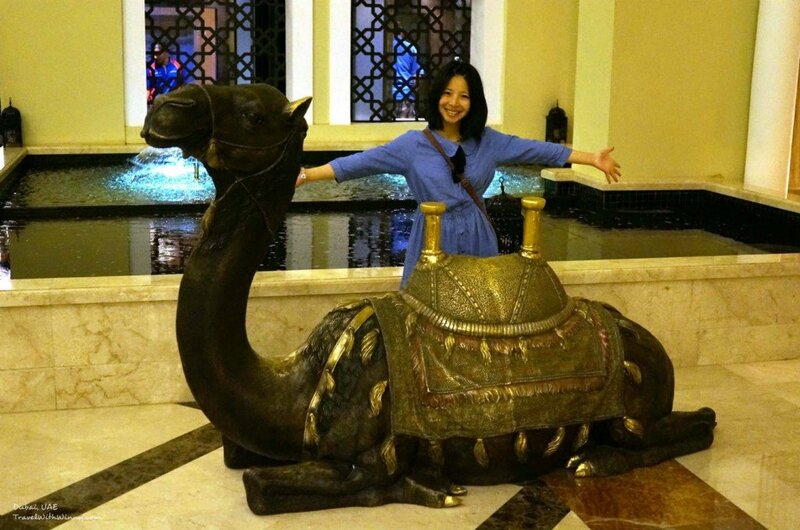 Winny with the big camel in the main hall of Mövenpick Ibn Battuta Gate Hotel! If you like my article or find it useful, please like our Facebook Page!! It’s all about the money and enjoyment! 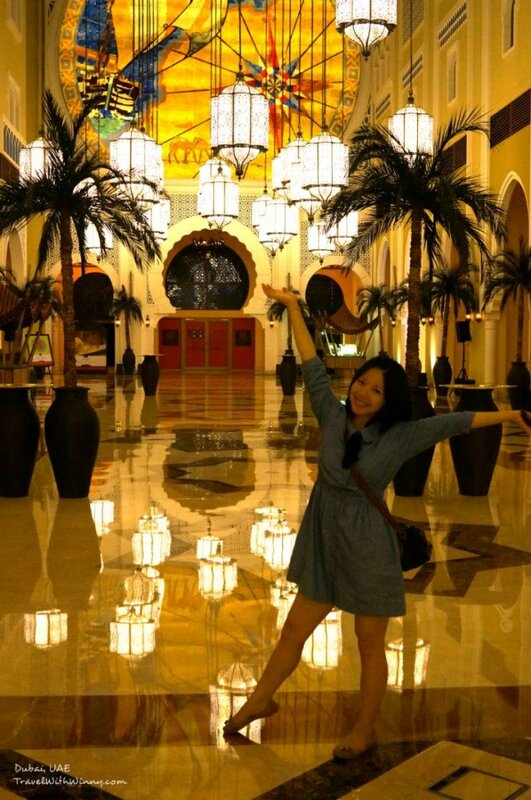 I have spent a great amount of my savings just to stay in Mövenpick Ibn Battuta Gate Hotel. It is actually very large, impressive, luxurious and expensive too. But the experience was awesome, which I can’t get from anywhere else.